StoryBook® Rose 'Sundance Kid' PPAF – These sunny little blossoms begin as coral buds, then open as soft yellow with a faint coral-blush overlay. 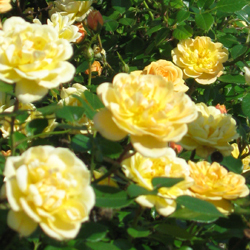 The mature blooms are soft yellow and hold their color even in hot weather. This Storybook variety grows somewhat more upright than the others and is a healthy grower on its own roots. In trials, Sundance Kid has proven to be iron clad resistant to disease, even in Florida and California.